What does 'signal' and 'lock-in' mean in a BIP? I have a vague idea about the jargon used over there, but what exactly do 'signal' and 'lock-in' mean specifically? Signalling simply means the miner of a block has set a bit in the version field to say that they support something. BIP 8 and 9 discuss this, it allows the miners to let the network know they are ready for the change or not. The version field of a block is 32 bits long, and if the top 3 bits are set to '001', 29 bits are free to be used for signalling. After a certain start time defined for a particular proposal, miners can set the bit specified to signal their support. 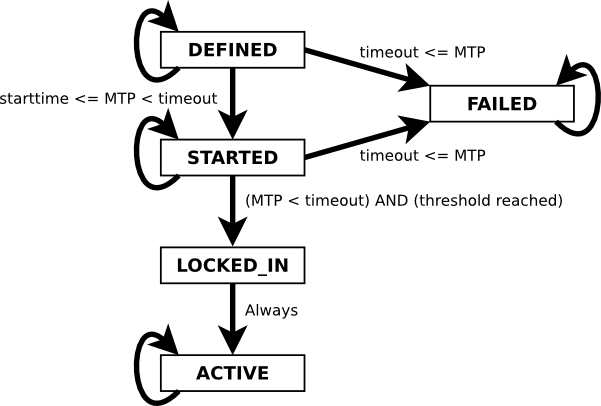 It is during this time that if at least a certain percentage of blocks are mined with the bit set in one difficulty retarget period (2016 blocks), specified as the threshold needed, that proposal becomes LOCKED_IN. Once it is locked in, it is ready to become active in the network. Locked in just means that it gained enough support to proceed. This can all be found in BIP 9. Note that miners aren't supposed to vote on softfork proposals, rather they are supposed to signal readiness when they have upgraded their software and perceive the community to be supportive of the activation as well. BIP9 specifies that a proposal needs to have 95% readiness in a single difficulty period in order to lock in activation. This is not a sliding window, but actually only evaluated once every difficulty reset. BIP91 used a shortened signalling period with only 336 blocks and an 80% threshold. After the proposal switches to LOCKED_IN, there is a grace period of the same length (2016 blocks for regular BIP9 activation and 336 blocks in the case of BIP91), after which the proposal switches to ACTIVE and starts to be enforced by all compatible software. Not the answer you're looking for? Browse other questions tagged consensus bip9-version-bits or ask your own question. What Does “Activation” Actually Mean In Bitcoin? What is the exact consensus protocol Ripple uses? How was the 95% miner adoption threshold determined? How does Proof of Burn work? “consensus over state” vs. “consensus over events”? Does the BFT solution from lamport guarantee liveness?